Liverpool supporters' groups are planning a walkout protest during Saturday's Premier League match at Anfield against Sunderland. The Spion Kop 1906 group - backed by the Spirit of Shankly (SoS) - have suggested fans leave their seats in the 77th minute in protest at the £77 top-priced ticket in the new main stand. The club have announced the increased price, up from £59, for next season. An SoS statement expressed its anger at "no explanation" from the owners. The statement added: "The outcome is extremely disappointing and a missed opportunity for Liverpool to lead in a fairer approach to ticket prices. 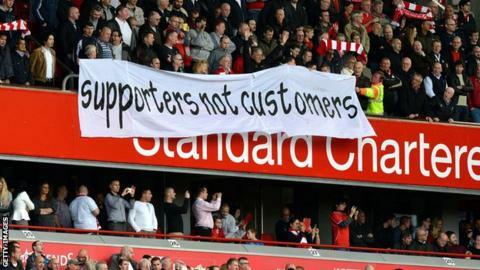 "We believe it is right and fair to lower ticket prices in order to sustain our support and subsequently the atmosphere inside Anfield." Liverpool chief executive Ian Ayre highlighted the freeze or decrease in 64% of season ticket prices and 45% of matchday tickets.